As you may know, I'm currently enamored with Star Wars: The Old Republic. There is a lot of interest right now in one of the mission categories called 'Slicing' which is basically the art of searching for and unlocking boxes full of money. (Maybe 'art' is the wrong word?) Critics of this crew skill believe it's a broken mechanic and there's a lot of debate about it in SWTOR circles. After I wrote up my previous slicing article, I got to wondering how profitable slicing would be at level 400 (the maximum level) after mission costs. I decided that, in order to satisfy my own curiosity, I'd log the next bunch of missions I ran, then try and quantify the return per mission as well as what I could expect in the log term. I ended up getting carried away with data collection and saved over 100 level 5 and 6 slicing missions. Read on to see the results! In order to try and maximize my profit, I chose my missions based on their level and their return, so I chose them in this order: rich missions first (level 6 first, then 5) then abundant (again, 6, then 5) and then moderate (6 only, didn't need to drop as low as 5). I never found any level 6 rich slicing missions and have read in several forums that they don't exist, so my data is limited to those 4 categories. In general, I found slicing to be consistently profitable. I've also come up with a (brand new?) 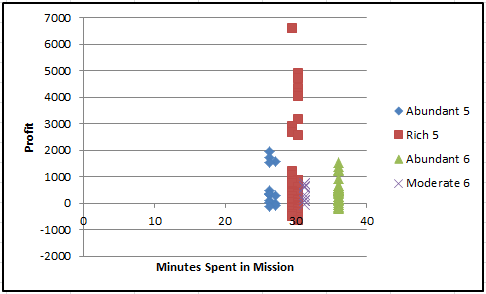 metric for comparing missions: Credit Per Mission Minute or CPMM. 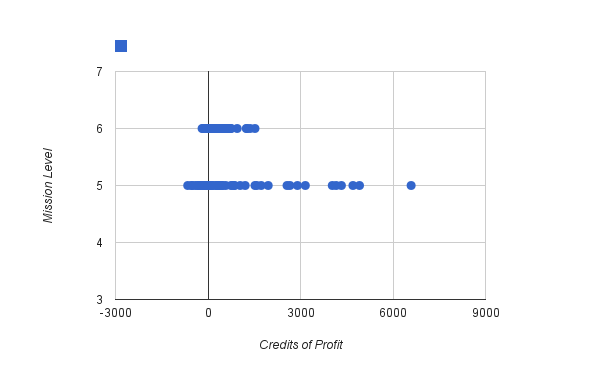 This is the profit received after expenses per minute of mission time. The data seems to indicate that the best (and worst) missions were those with the highest mission quality. Rich level 5 missions tended to out-do all the others on both ends of the spectrum; in fact level 5 rich missions tended to out-profit all level 6 missions by almost 3 to 1 on a CPMM basis. 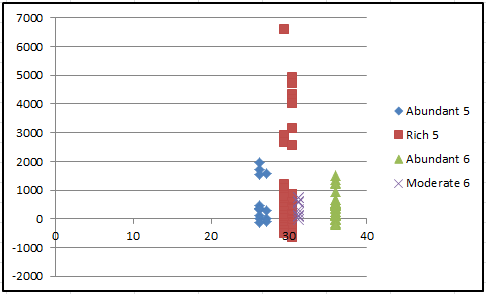 I found this data challenging to visualize, but this graphic helped quite a bit. This data makes it pretty clear that missions that are identified as 'rich' are much more valuable than others, even if they're lower level. After collecting this data, I realized that I didn't take into account the varying levels of affection that the different companions had for me. My highest level of companion affection was about 4500, which isn't terribly high, but could throw some mission results off from others. Fortunately, I didn't favor any companion/mission combinations, so that should be spread out across the different named missions. Also, I didn't take into account the value of the extra crew missions that are sometimes returned. Some are quite valuable, but since they were most commonly rewarded in missions that returned good rewards, adding these results would have skewed the good results even higher. It is still not clear whether other crew skills will become similarly profitable as players become able to craft gear and enhancements that are desirable for end-game players. It seems to me that many people overlook the fact that while slicing is a great income source, it takes the place of a gathering skill that would supply a primary crafting skill with crafting materials. I plan to stick with slicing for now, but it remains to be seen whether I will continue with it as I move into end-game content.